Groot Draks’ unbeaten run finally came to an end against the spirited Kai Tank touring side from Hong Kong. They had their heads in the clouds after their victory against Cape Town Cricket Club and the pilots were determined to make it two tour victories in a row. To honour the Groot Drak tradition, Kai Tak batted first and were soon on the ropes at 40/5. 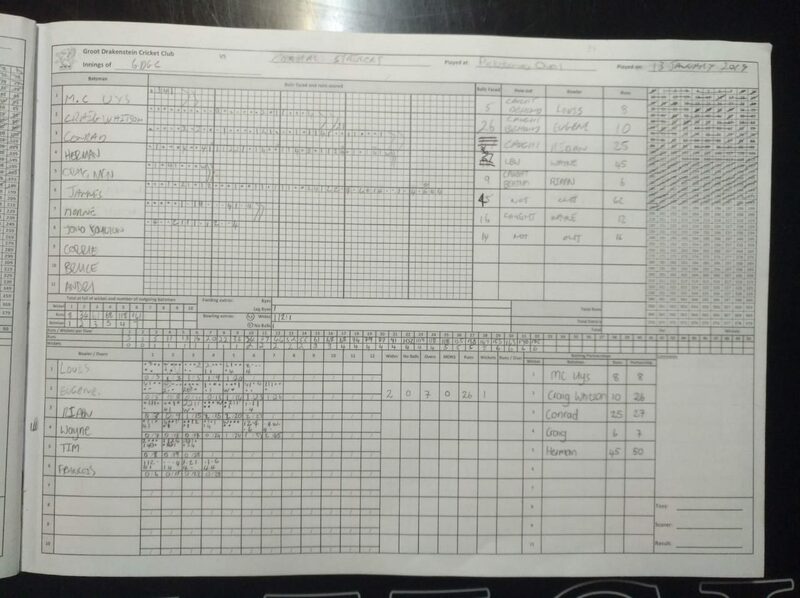 Our opening bowlers Colin Myburgh (3/18) and Corrie Brand (1/26) did an exceptional job. Just before the drinks break, Craig McNaught (1/1) bowled one magical over to send the tourists further into disarray. To ensure a proper game, skipper Jono Boulton took the foot off the proverbial jugular and brought some slower bowlers on. 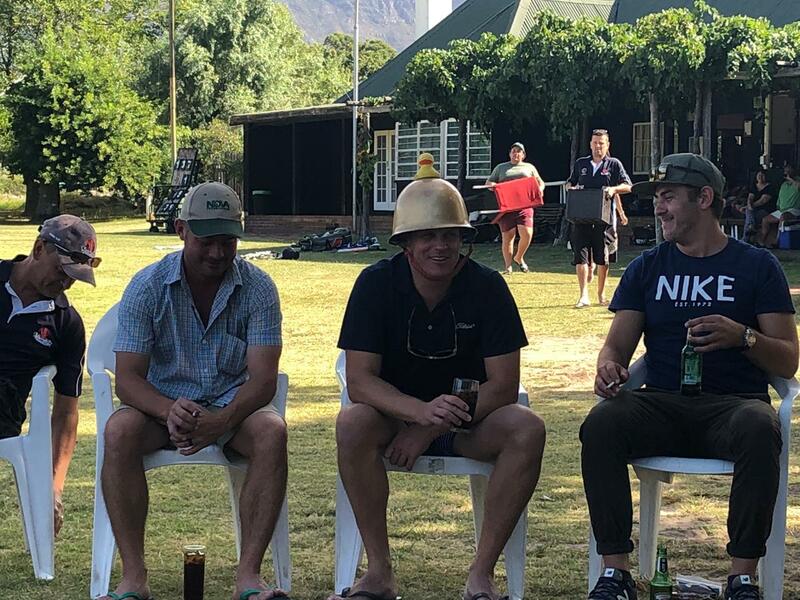 A South African, an Englishman and a Kiwi might sound like an intro to a bad joke, but after a while, none of the Groot Drak players were laughing anymore… Kai Tak’s SA-born captain, JP Du Plessis (56) and Matts Parkinson (35) steadied the ship. It was unfortunate that Kiwi Jeff Maw (44*) would end up short of a well-deserved 50 as the innings came to a close at 212 after 40 overs. Groot Drak, who bat fairly deep were confident and always thought the total was a achievable. Unfortunately, none of the usual suspects ended up in the runs. This was due to really good pin-point bowling aided by late Kai Tak swing bowling. 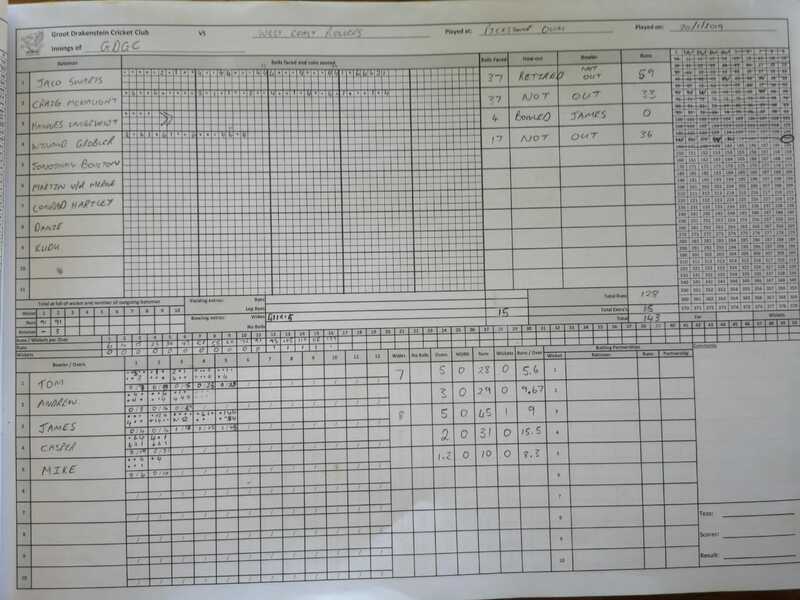 Colin Myburg (77) tried his best but eventually ran out of batting partners with Groot Drak falling short by 37 runs. Gus Simmers(24) and Jannes Mouton (20) got starts, but could not convert to a match-winning batting display. JP Du Plessis (who was only not given the man of the match award because he received it in their previous game) also ended up shining with the the ball with figures of 3/26. After a near cancellation and a three-player-donation from Groot Drak, Saturday the 26th of January 2019 saw what is always a great fixture, against Cape Town Cricket Club. A very solid start from the visitors meant that in the over before drinks, Cape Town lost only their first wicket for 85 runs. After being told that they were largely a ‘bowling unit’, Groot Drak knew this would be a tough game from here. Opening, Darren Nash hit a dominant 71, with valuable contributions from brothers, Jannie (29) and Andri le Roux (26 not out) further down the order. 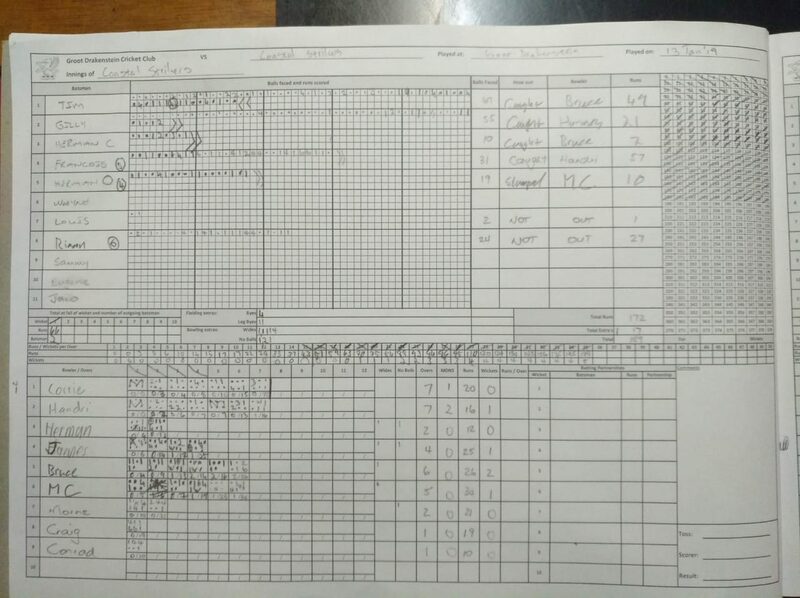 Good bowling performances from Corrie Brandt (0/28 from 7), Jannes Mouton (1/28 from 6), Angus Simmers (2/41 from 7) and MC Uys (1/31 from 5), kept Groot Drak in the game, albeit only just. Angus’ figures don’t truly reflect his performance, as he had two successful appeals retracted in two overs! At the half-way mark, CTCC had posted a very competitive target of 203 for victory in 35 overs at a required run rate of a just under 6 per over. Groot Drak’s openers, MC Uys (20 off 19) and debutant, Claude Chantler (21 off 31) got the local boys off to a reasonable start. Very few batters were allowed to settle as wickets fell regularly. 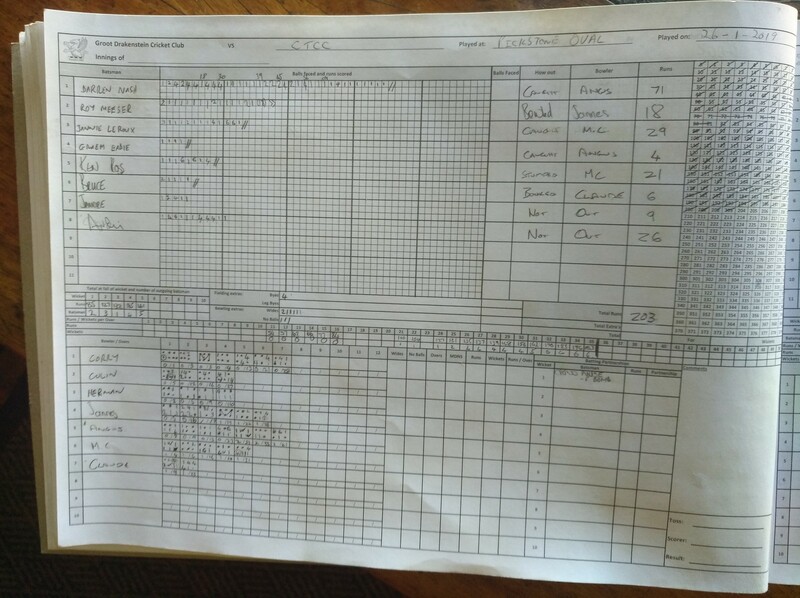 Wilhelm Esterhuizen played a great knock, scoring 37 from 37, supported ably by Jono Boulton (18 from 16). 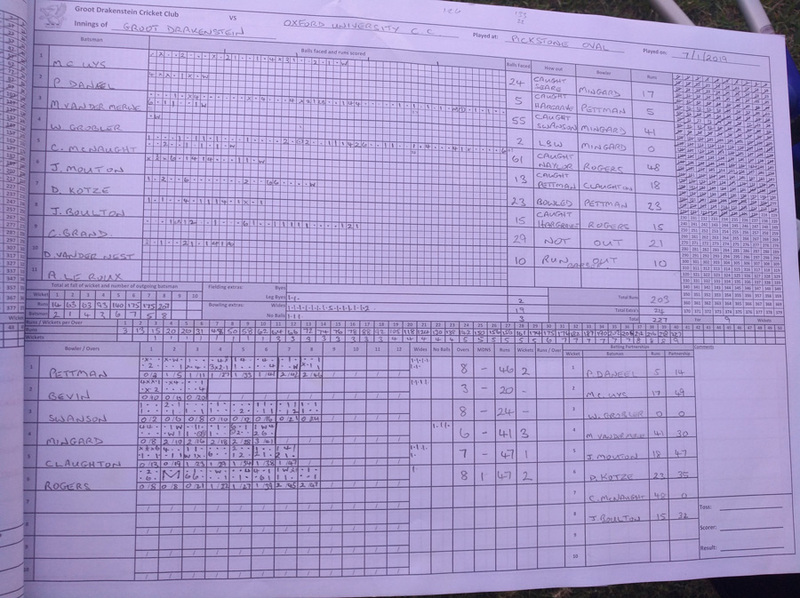 At 162 for 8, Groot Drakenstein were looking down and out as they needed around 8.5 per over with only one batsman to come. 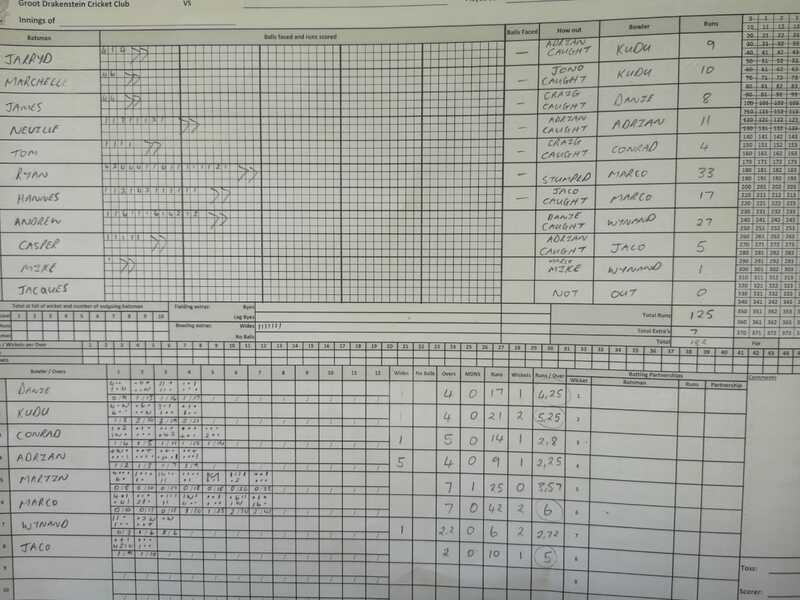 Jannes Mouton and Corrie Brandt put on a heroic 9th wicket stand, with Corrie smashing 26* from 11 and Jannes playing a very mature innings, ending with 19* from 19 to see Groot Drak finish in style. Securing a narrow victory, Groot Drak continued their unbeaten streak for the 2018/2019 season! 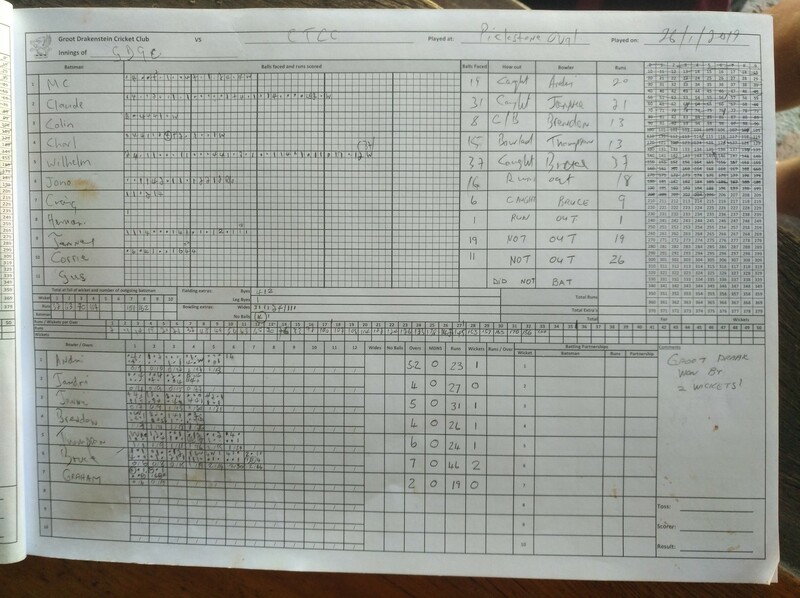 As is always the case against CTCC, the game was played competitively, but each player maintaining a sense of humour and sportsmanship throughout. A well deserved swim and fines meeting in the shade, followed by a quick post-match braai brought a fantastic day to a close. Congratulations to Corrie Brandt for picking up yet another Man-of-the-match award for his outstanding all-round performance. On the 20th of January 2019, Groot Drak hosted their great friends, West Coast Rollers at Pickstone Oval. Looking to continue their unbeaten streak, Groot Drak took the field with loads of energy. Danie van der Nest (2/21 from 4) and Kudu Kotze (1/17 from 4) did the damage up front, with continued pressure from Conrad Harley (1/14 from 5) and Adrian Raisbeck (1/9 from 4) . Some good catching from the Drakies saw the Rollers struggling at drinks, having lost 5 wickets after 17 overs. The spinners took over the attack after the break. Martin van der Merwe (0/25 from 7) and Wynand Grobler (2/6 from 2.2) kept things incredibly tidy and continued to hurt the opposition. Marco Bosman (2/42 from 6) and Jaco Swarts (1/10 from 2) took some valuable wickets as the innings was wrapped up, with the West Coast Rollers managing 138 all out. A quick lunch saw Groot Drak begin the run chase with openers Jaco Swarts and Craig McNaught (33* from 37). Despite some good bowling from the visitors, a few chances went awry, allowing the home side to capitalise early on. Jaco retired after a blistering innings of 59 from just 37 balls, which earned him ‘man-of-the-match’. Hannes Langeveldt (TFC) came in at 3 and got a corker of a ball that removed his leg stump for a duck. Wynand Grobler didn’t need any sighters and blasted Groot Drak to victory with a quick-fire 36 from 17 balls. The second innings lasted 16.2 overs before the total was knocked over. A post-match swim and beverage was in order after a boiling hot day of cricket. A few well-deserved fines were enjoyed in the shade, some good, some not so much. Even though the game ended a little one-sided, both teams played the game in a wonderful spririt and Groot Drak continue their unbeaten run in 2019. 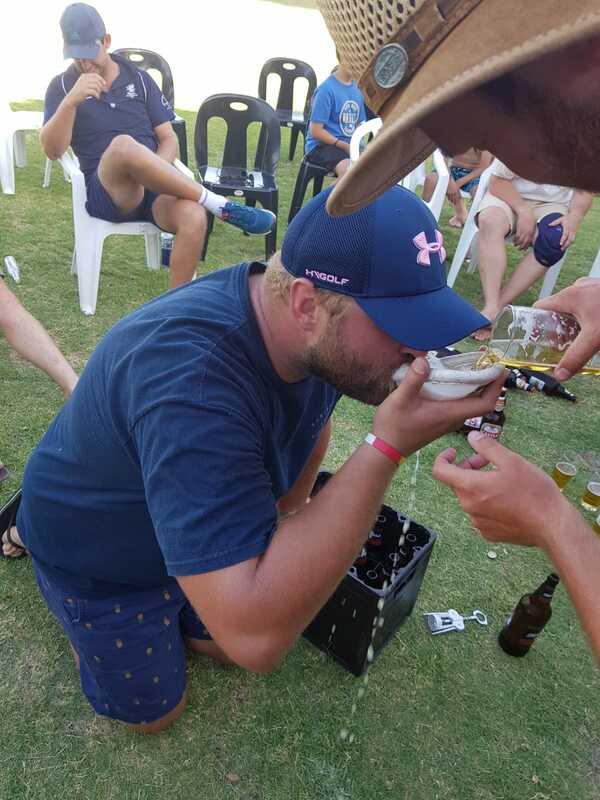 On Sunday the 13th of January 2019, Groot Drak hosted Coastal Strikers at Pickstone Oval. A cloudy and cool afternoon meant that bowling first was a great advantage for the home side. Groot Drak’s opening bowlers, Corrie Brand and Andri le Roux, bowled extremely tightly, with a barrage of unplayable deliveries – both unlucky not to get wickets in their opening spells, they ended up with 0/20 off 7 and 1/16 off 7 respectively. Going in to drinks, Coastal Strikers had only managed 43 runs, but still had all their wickets in tact, setting up the latter half of the innings nicely. Clearly, the Oros consumed at drinks had a little something extra in it as the visitors turned up the heat immediately. They scored freely, but lost a few wickets along the way. 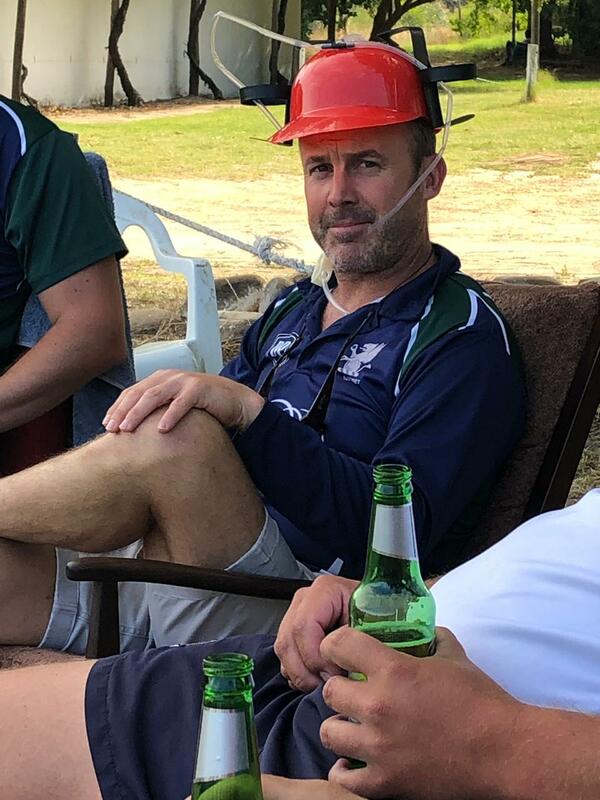 Most of the bowlers went for plenty of runs, but a great performance from Bruce Taylor (2/26 off 6) saw a welcome return to form for Groot Drak’s resident “spinner”. A quick-fire 57 off 31 from Francois allowed Coastal Strikers to set a respectable target of 189 at lunch. After a filling lunch, Groot Drak went out to start the run chase. Unfortunately, the openers were both nicked off early, putting pressure on the middle order. Conrad Harley (25 off 37) and Herman Fourie (45 off 37) did a fantastic job of rescuing the situation and giving Groot Drak a good chance at the drinks break. Needing 6.5 per over, Jannes Mouton strode out to bat and was later joined by keeper/batsman, Jono Boulton (16* off 14). Jannes blasted a man-of-the-match-winning 62 not out off just 45 balls to see Drak over the line with 2 overs to spare. As is always the case with Coastal Strikers, the game was played in a fabulous spirit, with both teams having a great outing and enjoying some well-deserved fines back at the clubhouse. 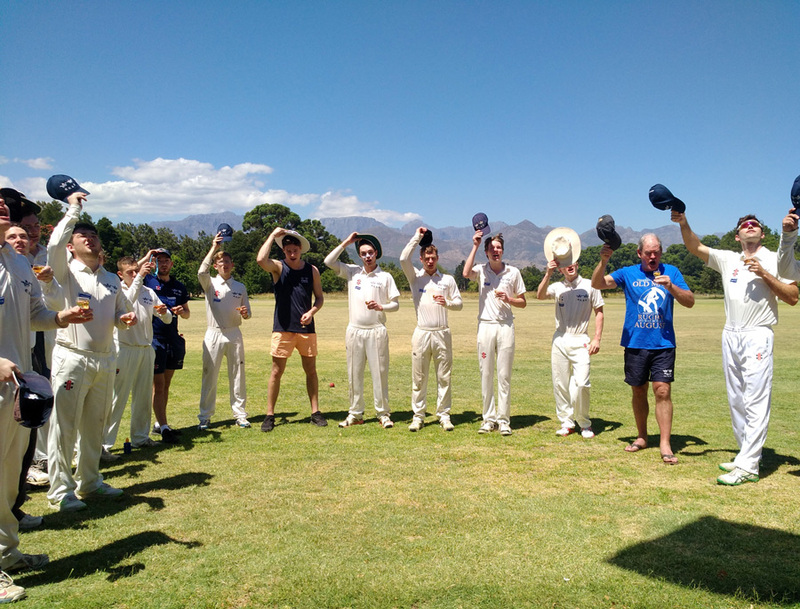 On Tuesday the 8th of January, Groot Drak played host to Oxford University’s first XI at Pickstone Oval. Rightly anticipating a tough contest, the home team selected a particularly formidable side to take on the young and fit students. 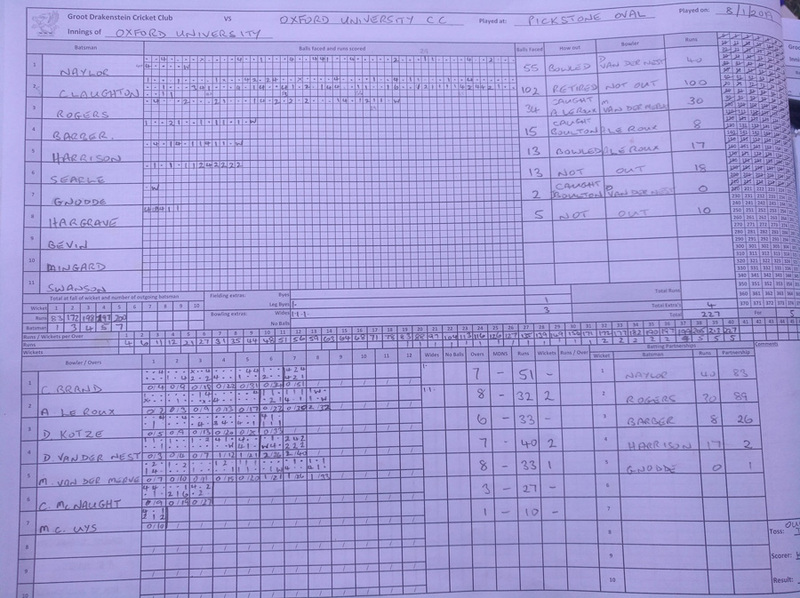 Honouring tradition, the visitors were sent in to bat and Oxford immediately made the significant age gap count by putting on a first wicket partnership of 83 runs, followed by a century from one of their openers. 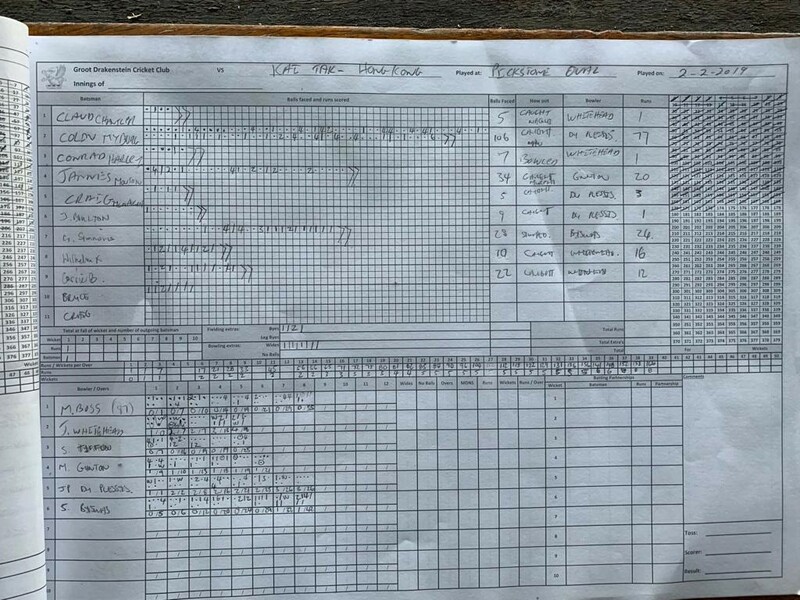 If not for a middle-order collapse, Oxford would have comfortably posted a score of 270+ in their 40 overs, but the Groot Drak bowling-and-fielding effort limited the visitors to 227/5. Particularly impressive spells from Andri le Roux (32/2 from 8), Martin van der Merwe (33/1 from 8) and Danie van der Nest (40/2 from 7) were instrumental in the resultant target. After a quick lunch break, Groot Drak headed out to attempt the run chase. A shaky start saw the local boys 63/3 before the innings was stabilized by Martin van der Merwe (41 from 55) and Craig McNaught (48 from 61). A few quick wickets saw Groot Drak in trouble – but, batting all the way to number 11, there was still a chance of victory for the home side. 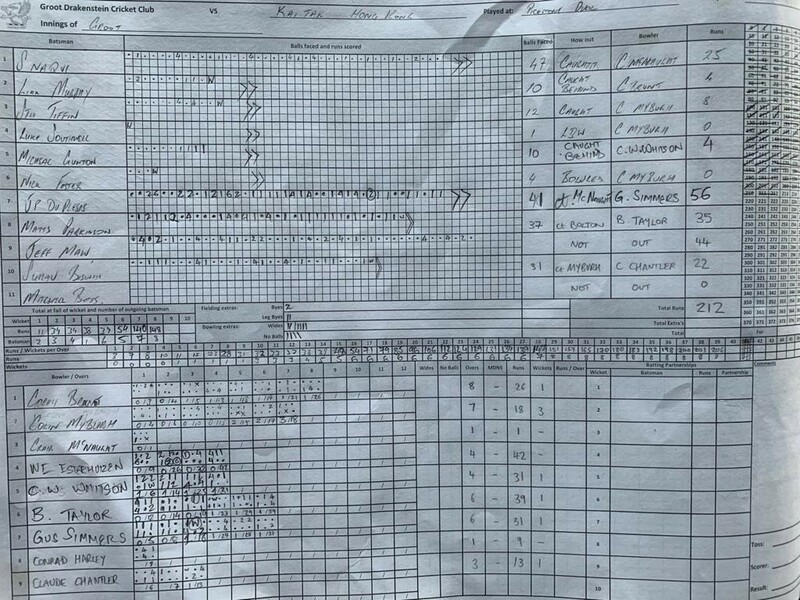 Great starts from Jannes Mouton (18 from 13), Kudu Kotze (23 from 23) and Corrie Brand (21* from 29) took the game down to the wire… needing one run for victory from the last ball of the match, some efficient fielding from Oxford saw a run out and the game being tied! The shared result was soon forgotten over a customary beer on the pitch and a brief history of the club shared with the visitors, courtesy of Richard von Hoesslin. A brief fines meeting warmed both teams up for what would be a fantastic dinner and bonding experience between, what we hope will be, two teams that begin a tradition of regular fixtures in the future. 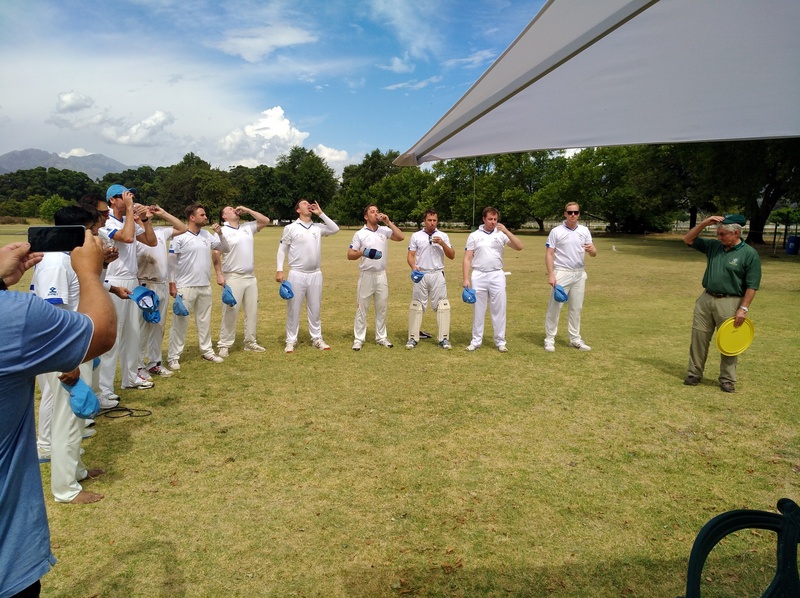 It was a wonderful opportunity to host such a fantastic bunch of cricketers, who, along with Groot Drak, enjoyed each aspect of the day, both on and off the pitch!